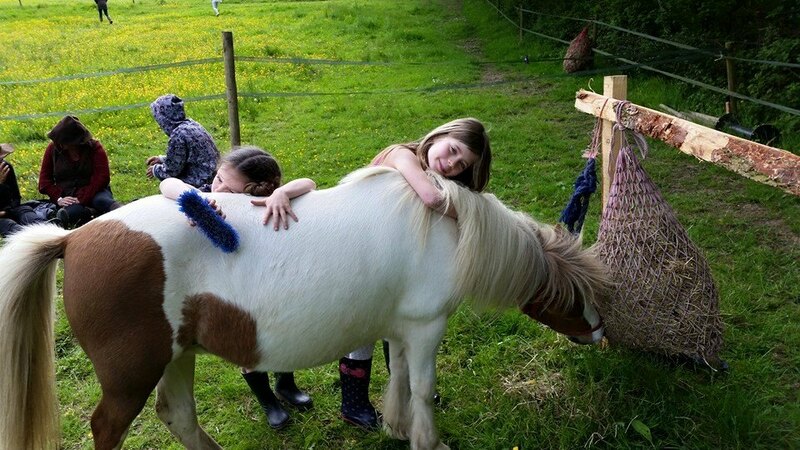 We have a Horse Area, where you can meet the horses, and come and take part in equine activities, games and education. We focus on how horses communicate with each other and us, and the history of horse evolution. Learn how horses behave and interact in the wild; explore the roles of prey and predator, and discover what it’s like to see through a horse’s eyes. Learn about the different types of brushes and why we use them, and how to groom and pick out the horses’ feet. Horses like to know that the person who is leading them is focused and confident, and that they can trust them. We will explore and practice being a calm, confident leader; firstly through games and role play, and then with the horses. Spend time in the herd, and take part in mindfulness exercises within the herd and in the tipi. Learn to connect with the horses and ourselves. Learn to set up, and then lead the horses around, horse agility courses. Horse shoe painting, horse mask making, horse art and more. Learn about and take part in the traditional skill of horse logging. Tack cleaning and tacking up, including harnesses. Take part in horse games and role play. We’ll also have quizzes, to enhance and test your knowledge on subjects such as The Points of the Horse, Horses and Senses, and more. Getting to know the horses is a popular activity! 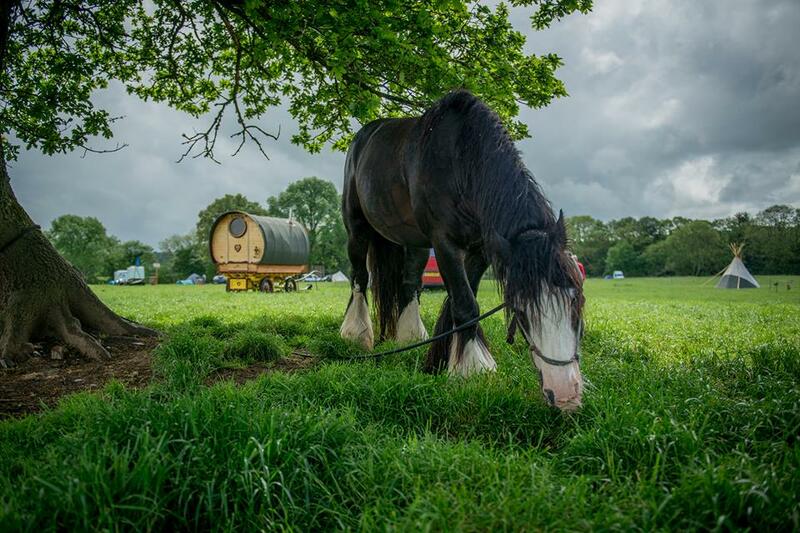 Once you have settled into camp, come and meet the horses. Get to know them, learn their names, their breeds, their personalities, and what they like and don’t like. See which ones you are most drawn to. On the Monday afternoon and Tuesday morning, we’ll discuss the week’s programme and you can choose which activities you’re interested in. You’ll have the opportunity to develop your knowledge and understanding of horses, and yourself. All activities will be posted on the board at the office with times and where to meet. All participants must wear suitable foot wear for horse-based activities. Angie, who runs the Hedge-U-cation Horse Area, creates the programme using techniques developed at Sirona Therapeutic Horsemanship, where she works for the rest of the year. Sirona is a registered charity, based in Newton Abbot, Devon, providing a range of activities where people learn about themselves, others and the world, through interaction with horses. These include Therapeutic Horsemanship, Equine Assisted Therapy and Equine Assisted Learning. To find out more about Sirona, please visit sironaequine.org.uk.